Ingredients: Water, Butylene Glycol, Cetearyl Alcohol, Glycereth-26, Caprylic, Capric Triglyceride, Cetyl Esters, Cyclopentasiloxane, Argania Spinosa Kernel Oil, Argania Spinosa Kernel Extract, Hydrolyzed Adansonia Digitata Extract, Serenoa Serrulata Fruit Extract, Sesamum Indicum (Sesame) Seed Extract, Glycine Soja (Soybean) Protein, Lupine Amino Acids, Hydrolyzed Elastin, Soluable Collagen, Hydrolyzed Extensin, Hydrolyzed Keratin, Tocopheryl Acetate, Dimethicone, Cyclohexasiloxane, Ceteth-20, Glyceryl Stearate, Cetyl Alcohol, Isocetyl Stearate, Sodium Polystyrene Sulfonate, PEG-100 Stearate, Carbomer, Triethanolamine, Fragrance, Disodium EDTA, Sodium Hydroxymethylglycinate. This is a good product to use after you've washed your face and removed your makeup. 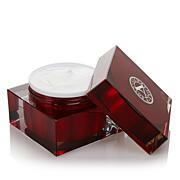 However, I would NOT recommend using it underneath makeup as it is quite oily. My face was so shiny and oily that I had to redo my skin just to be able to apply makeup. It is wonderful for night time. I love this from Andrienne as always, I can already tell the difference! I have been using this now for 2 weeks. 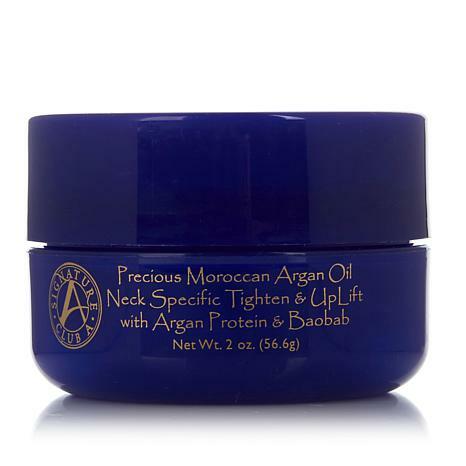 I honestly have not seen a drastic change as far as tightening or uplifting however it is making my neck super soft without feeling greasy. has a scent that is not overpowering. I have faith that I will start seeing improvement eventually with this product. many times it takes a bit to see results because they are gradual. i would purchase this for the quality alone and the way it softens my skin. 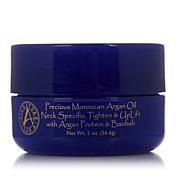 What I can say about using this product that my neck looks SOO much better than others my age which is also 79. I havesuch minor lines on my throat. Give it a try and think you will be happy, too.